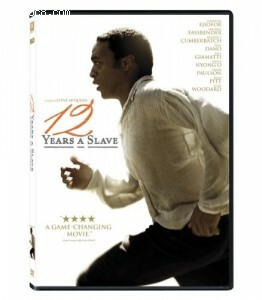 Synopsis: It is 1841, and Northup (Chiwetel Ejiofor in a gripping performance), an accomplished, free citizen of New York, is kidnapped and sold into slavery. Stripped of his identity and deprived of all dignity, Northup is ultimately purchased by ruthless plantation owner Edwin Epps (Michael Fassbender) and must find the strength within to survive. Filled with powerful performances by an astonishing cast that includes Benedict Cumberbatch, Brad Pitt and newcomer Lupita Nyong'o, 12 Years A Slave is both an unflinching account of slavery in American history and a celebration of the indomitable power of hope.